Tommy was a feral cat that my partner rescued. She found him laying on the ground, soiled, ill and dying. She wrapped him in her jacket and brought him home, cleaned him up and took him to the vet, where he was given a 50/50 chance of living. These are the same odds my partner had been given after being in a car crash in Florida. After weeks of tender love and care both Tommy and my partner were on the road to recovery. Tommy would like riding with his feet on the dash, and liked seeing the lights at Christmas time. Everyone loved Tommy. He could also detect seizures and knew when my partner was going to have one. Without Tommy’s love, loyalty, devotion and sense of intuition my partner wouldn’t be alive today. Our love for him has helped rescue thousands of feral cats. Tommy, for whom the organization is named after, has given much love and affection and became the love of our lives. Sadly, one winter night, he asked to go out and my partner let him out. He patted him and said, “be a good boy Tommy”. As I stood at the window watching him play in the snow, that was the last time we saw him. 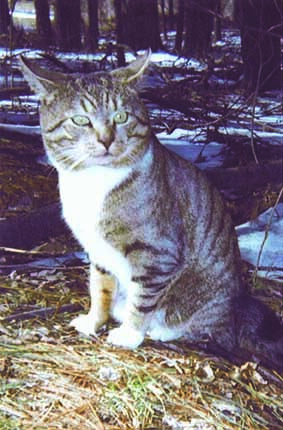 In our search for ‘Tommy’ our population of feral felines has grown to approximately 500 feral cats.